who (else) has this badge? To help you become familiar with the process for earning badges in this program we have laid out this page like all of the other badge pages. In the "LEARN" section you will find material for reading, watching, or listening. If you haven't already done so, log in at ND and complete the enrollment form. 2. WATCH the "What is an Eportfolio" video shown at right under "Helpful Resources"
3. 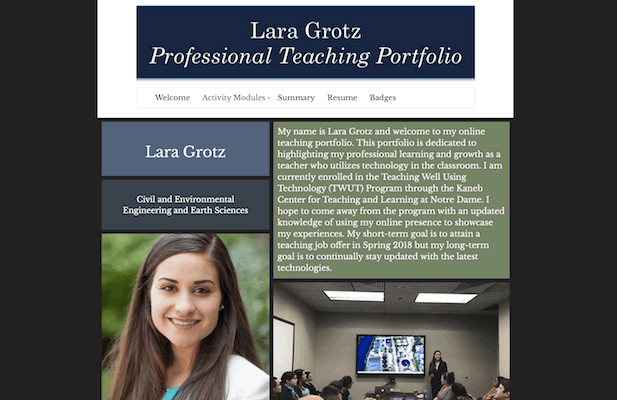 PREVIEW the completed ePortfolio shown in the image below (click to view). You may choose different modules and will perhaps write less. 4. VIEW the slides in "Sample ePortfolios" at right. They are from other contexts at Notre Dame. You can click an image to see it large. In the "REFLECT" section, you are asked to consider what you've learned and created, as well as make connections with your previous experience or future goals. Choose "Teaching Well Using Technology 18"
Click Enroll — the password is "excellence18"
Locate "Template 18 - Teaching Well Using Technology"
On the "Create Your Eportfolio Screen"
Enter the title "[last name] - Teaching Well Using Technology"
Click the template labeled "Teaching Well Using Technology 18"
A photo of yourself, ideally doing something academic. A background photo for your home page - something subtle that won't distract much. Introduction - create a basic personal introduction. LinkedIn - replace the address with yours OR delete the module. Image of yourself - replace the placeholder with the image you found above. Background image - replace the current image with the one you found above. The New Digication Tutorial video (at right) provides a helpful overview. For the orientation activity, we're doing something a little different. On the Welcome page add an introductory message that is at least 100 words long. Link - a text link to your department, lab, blog , or other site. The "SHARE" section summarizes what needs to be on the eportfolio page you have created for the badge, and then asks you to submit it as an "assignment". 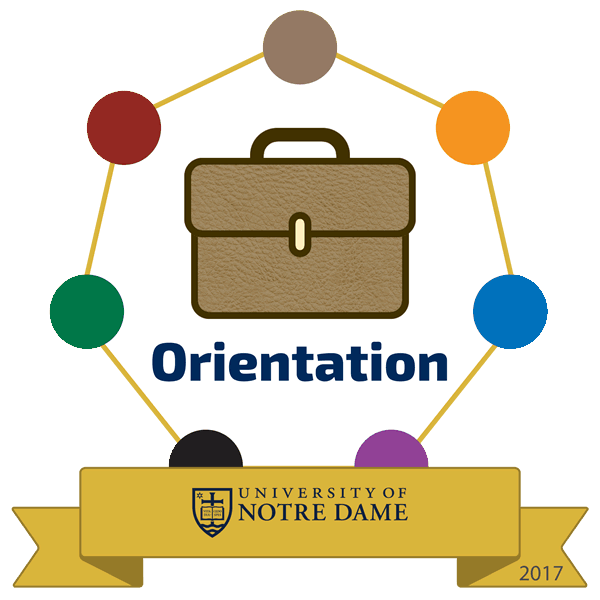 From your ePortfolio, submit the Welcome page for the "Orientation" assignment. All of the evidence is on the page, so you don't need to upload files as well. If you have correctly completed the requirements, you will receive an email inviting you to claim and display a digital badge as visible evidence of this accomplishment. provided under a CC BY-NC-SA 4.0 License.